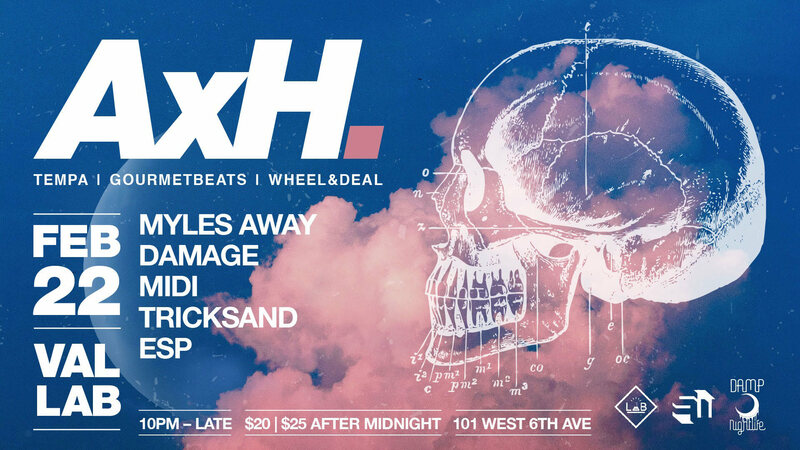 AxH has been dedicated to underground bass music for nearly two decades. He got his start as Prodigal Son, producing Ragga Jungle that received praise and plays worldwide. AxH fell in love with Dubstep in 2006, while serving overseas in the U.S. Military, and has been pushing forward ever since! He has been releasing music digitally and on vinyl since 2004, and has played all over the world, supporting his releases. AxH is known for playing his original material; pushing his deep, dark, and heavy style. In 2013, he was the first American DJ and producer to be signed exclusively to Tempa Records, and his debut release on the label, the ‘Destroy EP’, dropped in February, 2014. Summer 2014 saw his second Tempa release on the world-famous ‘Tempa Allstars 7’ compilation. His debut Dubstep album, entitled ‘Push Back’, is currently out on Brooklyn-based Tuba Records. With another Tempa EP forthcoming, as well as releases on other respected Dubstep labels scheduled for the future, AxH doesn’t appear to be slowing down any time soon. The Vancouver Art and Leisure Society is a radical artist run organization devoted to presentation, programming, and advocacy of art and leisure in unconventional spaces and ways in Vancouver. We believe art and leisure should not be limited by space but by idea; presenting events in both professional institutions and nontraditional spaces, but always favouring the unexpected, the temporal, and the experiential. Our programming is site-specific from warehouses to art centres, public parks to festivals, with no scale nor scope too large.